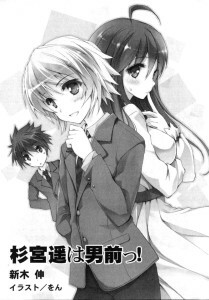 3 Minutes Boy Meets Girl – Chapter 16/19: Haruka Sugimiya is a real man! Act 1: ‘I have a Friend’. The prettiest girl in class spoke to me as she looked up, and I guess it’s a lie to say that my heart didn’t flutter as a result. To be honest, I felt like a born winner when I was invited by her, with those bashful eyes, to a corner of the classroom. I’ve been called a blockhead for 15 years, but even I understood immediately once I heard her say this. My good friend—Haruki Sugimiya, is, and I repeat, really a boy. His face really was not manly in any way. To be honest, he was rather effeminate. His body shape was not hunky in any way. To be honest, it was petite. However, his actions and attitude were straightforward, blunt in his words, and honest in his attitude. Without a doubt, he had a model flair of a real man. It is a critical moments, a month into my life as a high school student, where we start to gather in our cliques. Thus, Haruka, who did not belong to any clique, but had somehow managed to be beyond them–well, he’s really dazzling. So dazzling that the prettiest girl in our class, Yuuri Fujieda, could not hide her interest. Yuuri Fujieda completely discarded her usual matured, caring appearance, and had become a young girl who was completely in love. She continued to fire one question after another at me. It’ll be great if that expression of hers is for my sake–the amount of time it took me to snap out of this thought…yeah, was about a few seconds. I grab Fujieda by her arm while she’s trying to retreat, and pulled her over. That haruka’s grinning away, probably sensing that something’s strange as he watched Fujieda and me to approach. I leave the duo to talk it out, and return to my seat. While the noon break was still bustling, I watched the duo alone, forlornly. Even though it’s the role of Cupid, I’ll take it without any complains. It’s my fault for being that guy’s ‘friend’ after all. It was the day after the entrance ceremony ended, the noon break of the first day of classes. I heard my name called by someone who rolled his tongue, and I turned back to look. The ones calling me were three boys. They were close together, their chairs turned around as they sat relaxedly. To be honest, I really felt as though I was in a pinch in this classroom, where I have no acquaintance. I really envy those guys with the social skills make friends on the second day of school. To me, they were saviors, creating chances for me to talk to me. Looking at their eyes, it looks like they’re glowing!! One of them said, and the other two added “Ah, I want curry bread”. “Melon bread for me, and coffee milk”. Am I–asked to be their gopher? I was about to start running with hope, but at this moment–I was stopped by a boy who suddenly appeared. Talking to us with an astounding voice was that guy–Haruka Sugimiya. The guy was angry that Sugimiya just interrupted, so he retorted with a crude attitude. He stood up, and looked was tall and powerful. Sugimiya didn’t back down, and stared back intently at his opponent despite the difference in height. This faceoff continued for a few seconds. And the first to look away and click his tongue so loudly was the guy who wanted me to buy bread. He turned aside to ask another classmate, and never bothered to look at Sugimiya and me. Sugimiya–ah whatever, let’s not be so unfamiliar now, so I’ll call him Haruka–turned to look at me, and showed me that signature wry smile of his. To be honest, regarding what Haruka was talking about, I didn’t really understand back then. I guess I was showing an idiotic face back then. Haruka laughed. If my memory serves me correct, this was the first time I saw his smiling face. Again, I showed my typical idiotic face. I never thought of such a possibility before. If they’re friends, I’ll go buy one or two buns. That was the only stupid thing I could think of. He narrowed his eyes in a teasing manner as he looked to a corner of the classroom–right when that classmate called Yokoyama refused them, saying ‘Don’t wanna’. That was the first time I spoke with haruka–but it was Haruka who saved me when I was about to be bullied and ordered around. I could tell that he wasn’t trying to be humble, but that he had such conviction and qualities, heartfelt thoughts. And so, I immediately worshipped this man known as Haruka Sugimiya. I grabbed Haruka’s hand firmly. And so, Haruka and I became ‘bosom friends’ on that day. Haruka and Fujieda appear to be having fun chatting. Haruka’s talking with his unique manner of staring at someone directly, sometimes showing a gentle smile as he talks to Fujieda. The initial tension Fujieda had vanished completely, and she’s giving a ringing chuckle. I do find it amiss that he’s showing such a face to the smile of the prettiest girl in our girl. If that guy’s happy, I’ll be happy too. He’s a ‘bosom friend’ of mine after all. It’s a certain Sunday sunset. I was sitting on a bench at the plaza in front of a train station. Whenever the minute hand on the clock tower ticked, another layer of wrinkle appear on my face as I fold my arms. There’s a reason why I’m fuming. Both the clock on the tower and the watch on my wrist are showing 2.42pm. He’s the one who invited me out, and yet he’s 42 minutes late. How irresponsible is he anyway? He fails as a friend. That bosom friend of mine, Haruka, has been nagging about my clothes recently. My clothes are untidy, too old, or something, or that my clothes don’t match me, that there’s someone who actually wears a T-shirt with the words ‘Underground Man’, unbelievable words anyway. If it’s clothes Haruka chose, I’ll just wear what he thinks fits me, and he won’t be able to say anything. I did leave it to him to decide. But that Haruka’s really slow. Ah, now that I mention it, I kinda realize something. I think I was the one who proposed this idea, not Haruka. Shouldn’t I be the one who fail as a friend? I’ll reflect on it a little, no, a lot. I should do so as a friend. I guess he’ll forgive me for putting that unjust label. Same goes for me in that I have to forgive him even though he’s late for so long. In any case, we’re ‘bosom friends’ after all. My dead serious, silent face breaks into a giggle, and I guess the mother who’s about to walk in front of me pulls her kid away, maintaining a distance of 5m. I pat my face back into a ‘normal’ expression, and continue to wait for Haruka’s arrival. Again, I check the watch. It’s now 2.45pm. I then decide that I won’t pay attention to the time anymore. I stop myself from feeling anxious, return back to being calm, and look around the plaza. At that moment, I see a girl running on the plaza, dressed in a white one-piece dress. Something seems strange here. Why is that girl running so hard…? That long, silky hair’s swaying with the wind as she dashed forward. She’s a pretty girl who’s basically kicking at her skirt–well, that’s already an eye-catching sight. Like me, there are a few onlookers staring at the girl. She continues to run down the plaza, looking back at times, turning her head left, and then right at times. Right when I’m wondering when she’ll run by me–she starts to look straight forward. And for some reason, she’s looking straight at me. And what I can force out from my throat is just an embarrassing shout. Her eyes are showing uneasiness and fear, flickering with hope and anticipation from time to time. There’s a girl in a white dress basked in the sunlight of May, and her body is glittering with light. On top of that slender body of hers is some nice, long black hair. I don’t know what anyone else will think, but this is my current ideal. The ideal pretty girl in my heart. And right now, she’s looking at me, only at me. Is there any boy who’ll say no in such an instance? No–the answer is definitely no. I immediately get onto my feet in exuberance. The girl immediately gives me a smile, and it’s telling me that’s enough. In any case, whoever she’s running from, no matter how tough the journey will be, I don’t know, but with her smile, that’s enough. Shall die for your sake. A group of black clothed men entered the plaza. They’re probably chasing after this girl, I guess. Dozens of them are dressed in black suits, wearing black glasses, looking around. At the same time, a few of them are locked in on our position. I grab the girl’s hand, and begin to run. Her little hand is so slender it’s shocking, and I grab it, trying my best not to hurt her while I made sure not to let go, and begin to run. We run from the plaza to the first level of the train station. Both of us pass through a stall in the food market selling radish and cabbages. And by the time we see the black-suited pursuers, we’ve already passed through the shop, running out of the glass door on the other side. Then, we again pass through the floor of another food stall. I’m not running away without a plan. If I’m just running away, I’ll get caught. To shake them off, I need a ‘strategy’. I lead the girl along to a ‘certain place’ only I knew, a place I used to play in. This shop that sells takoyaki, taiyaki and other stuff is a shop I used to patron often. The boss would often sell me 120 Yen taiyaki when I only had 100 yen to pay. But this isn’t the time to greet the aunt. Auntie’s teasing voice becomes distant, and we stop at a dead end. The girl’s voice and body stiffen. The wall at the dead end is sealed by wooden, and after removing the boards, there is a door that has the words ’emergency exit’ on it. Right when she steps through the door, the pursuers have arrived. While the girl reaches her hand out to me, seemingly saying ‘hurry here’, I wave her hand off, preparing to close the door. This isn’t going to end with two people vanishing from a dead end, but as long as she escapes from the other side, I guess that’s half of my mission completed. By passing through this emergency exit, I’ll reach the other side of the station, and that’s a shortcut. Any other way around, and it’ll be a long walk. I face the black-clothed men who are running here, and charge right at them. Trip their legs, pull their shirts–I’ll do my best to stop their progress. Even though I’m beaten up and sent flying, I continue to lunge at them without a second thought. I can’t let them pass through this door. This is my promise with her. The girl said ‘save me’, so I made a promise with her, telling her to ‘leave it to me’. Auntie’s shrill scream can be heard from afar. Those black-clothed men seemed to have given up as they clicked their tongues and leave. Maybe someone did see where the girl escaped from, but I bought her enough time, so I guess she should have escaped successfully. I lean on the wall behind me, lying there. Auntie run towards me, the sweet and spicy scent of sauce and meat feeling reaching me. I continue to remain limp on that icy floor, my hand clenching and relaxing, clenching and relax, over and over again. It’s the hand that held that girl. My palm still has the touch of that girl. The feeling of those slender finger bones is something I can’t forget for quite a while. At this moment, the minute hand on my wrist enter my sight. It’s 2.48pm now. When I first looked at it, it was pointing at 2.45pm. It’s now 2.48pm. 3 mere minutes have passed. But all I feel is that the time I spent with that girl is a lot longer than I thought. In fact, it’s just 3 minutes, but I completely lost to these 3 minutes. At this moment, I know that the concept of ‘love at first sight’ really exists. I look out of the window, and sigh. Ever since the 3 minutes encounter the previous day, my heart feels like there’s wings growing on it, and I just feel restless and fluttery. –Suddenly, I sense someone approaching me. My good friend Haruka Sugimiya approaches me with an uneasy look. I ask, and Haruka murmurs and stammers a few words for a few moments, before speaking up. With my hand holding my head up, I look up at Haruka. In other words, Haruka’s apologizing to me for being late. Haruka shows a weird face as he begins coughing lightly. I’m waiting for the hot water to cook my cup noodles that’s to be my dinner, waiting for 4 minutes when Haruka, carrying his own sports bag, is standing in front of the door with a serious look. Well, on a side note, waiting for 4 minutes instead of 3 is a trick to a delicious cup noodles. That has nothing to do with this though. My hand’s holding onto the disposable chopsticks as I usher Haruka into the house first. It’s a 6 tatami room with a kitchen, a place for refuge for me, who’s unable to stay at home for some certain reason, so I don’t have to worry about anything. And Haruka sat down lightly like a girl in the middle of the tatami, looking intrigued as he scans my room. Leaving the cup noodles I have yet to begin eating in the kitchen, I pour some water into a mug, and hand it over to Haruka. Haruka grins as he receives a mug, his throat letting out sounds as he gulps it all down. Looks like he’s really thirsty. I wait for the opportune moment to ask, and haruka nodded. I can’t help but exclaim. Political marriages or not, there has to be a limit to how far off from the times it is. I heard that Haruka’s family is a rather powerful one–but I never expected them to be so influential. No matter how rich they are however, our friendship is unshakeable. Haruka nods firmly. Maybe he’s delighted that I agree with him. On a side note, Ryuusei is the overly awesome name of mine. In our class, only Haruka calls me that. Of course, I do call Haruka by his name. We’re ‘bosom friends’ after all. Haruka states with heavy breathing, grabbing at the mug in his hands firmly. Again, I pour some of the ‘delicious Shidou water’. And then, I bring Haruka’s clothes over. I guess he has a change of clothes here. The bag’s completely filled, probably stuffed with items for leaving home. Haruka receives the cup, and again looks skeptical. Haruka suddenly stands up, the water spilling on the tatami. Good thing it’s water. This Shidou house doesn’t have any refreshing drink in this 4 and a half tatami space. Haruka yells as he points a finger at me. Why is he lashing out at me now? He grabs the bag from my hand forcefully, hissing. I can hear the sound of clothes rubbing behind me. It sounds like he’s changing. Why do I need to turn around when it’s a guy changing clothes? Not knowing the reason, I grumble quickly in my heart. The sound of clothings rubbing continue for a while. Haruka’s taking his own sweet time changing clothes. It’s kinda long, to be honest. Now that I have permission, I turn around. I’m about to grumble, only to stop. Haruka’s dressed in a white one-piece skirt in front of me, and really meshes well into the image of a girl. He then puts his hand on his head, his fingertips tugging at some strands of the short hair as he pulls it off. The hair’s pulled down by gravity, along the shoulders, down the arms–beyond the waist, and bounces up. It bounces, showing some slight curls, and falls straight down. Standing in front of me now is no longer Haruka, but the girl I fell in love at first sight. I point at Haruka, unable to talk. Haruka’s the girl in the white one piece dress. In any case, I wasn’t able to think of this. Haruka’s my close friend, not a love interest–and he’s a guy–no, that’s just me thinking that she’s a guy. In fact, she’s been a girl all this time? Or is my first love of a girl actually a guy? I guess I’m trying to prove that Haruka’s a different person from this girl in front of me. Haruka tosses the short hair in her hand onto the floor. The voice remains as Haruka’s. This really doesn’t make sense. I continue to listen to my good friend as I try my best to calm myself down, trying to understand what’s going on now. Haruka pulls the skirt to the sides, trying to sit on the tatami. She’s sitting with her legs folded, completely different from before, in a formal manner. Why’s she giving me such a cute face when she looks as me, and also a question? I guess I should be saying that it suits you–but which? Unable to respond, I remain silent. How am I supposed to view my good friend–and the girl who I fell in love at first sight? Which identity? And Haruka lifts her head, trying to gather my attention back. This tough question is raised. Of the two choices, which do I choose? And so begins this frustrating life of mine of living with this real man and a ‘pretty girl’ of my best friend.